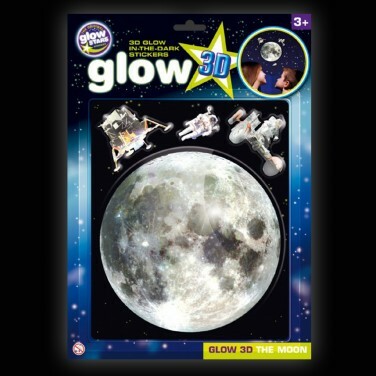 See the full moon shine night after night without even looking outside with this stunning 3D glow in the dark moon sticker! A raised lunar landscape features the craters and dark shadows of the surface of the moon all highlighted by a gentle glow. 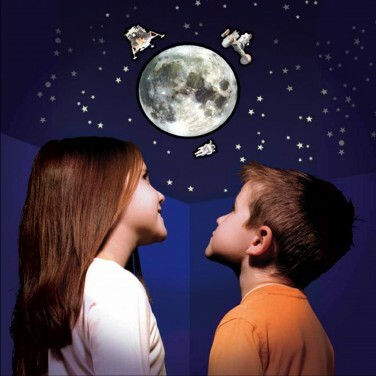 With three additional stickers included; astronaut, moon buggy and lunar landing vehicle, you have all you need for a stunning lunar themed room decoration! Simply place the stickers where they will receive maximum exposure to light allowing them to charge and then view in pitch black conditions for a soothing glow. Allow exposure to light to charge before viewing in pitch black conditions with NO ambient light for best effects.